Recently, I sent a draft article to a friend for review. Although I expected to get a call to discuss the article, I didn’t expect we would discuss how I made the document. Specifically, he wanted to know how I created the background text or Microsoft Word watermark that read Draft. And it’s just as easy to do with images. Like many people, if I send a Microsoft Word document which is confidential or a draft, I like to include a watermark. The process is easy but varies based on which version of Microsoft Word you use. Regardless of which version of Microsoft Word you’re using, the watermarks won’t show in Normal view. You need to be in Print Layout view to see them. From the Office ribbon, click Page Layout. In the Page Background group, click Watermark. Click the tiny down arrow. 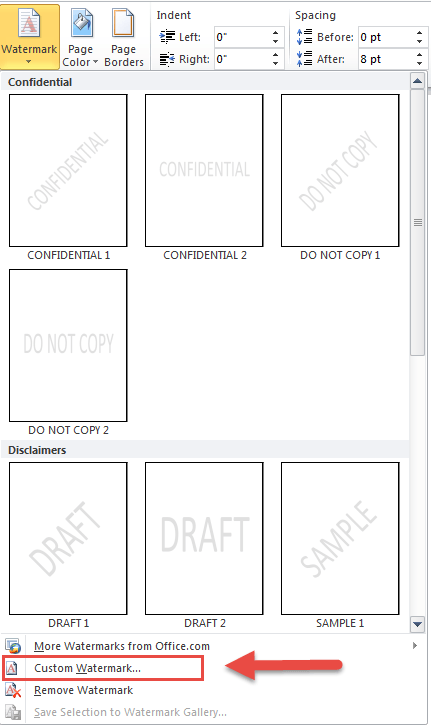 A dialog will appear with images of common watermarks such as “Draft”, “Urgent”, “Confidential” and so on. Click the watermark you’d like to use or select Custom Watermark. A new dialog appears that lets you create a watermark using an image (1) or you can create one with custom text (2). Click the Text watermark radio button to enable the options. Click the down arrow to the right of the Text field. This will provide other entries. Type in your custom text. By default, your text watermark is set at a diagonal and is semitransparent. You can change these options and click Apply to see the changes. Your watermark will now appear on every page. 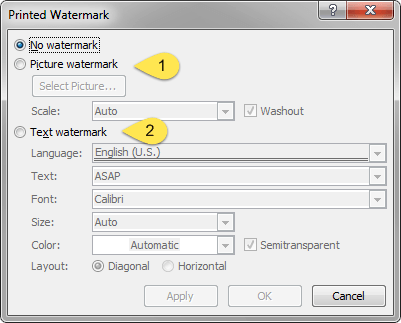 In the Printed Watermark dialog, select the radio button for Text watermark. In the Text field, either type your value or select from the predefined list. Select any other options and click the OK button. In my friend’s case, he was using Microsoft Word 2000, which takes more steps. While there are a couple of ways to do this task, I prefer including the watermark in the header. This tends to confuse some people as they think the header is restricted to the top of the document. From the View menu, click Header and Footer. The Header and Footer toolbar and placeholder area appear. From the Insert menu, select Picture and then WordArt. The WordArt Gallery appears with a style grid. Click the style you would like to use. I prefer the top left style. 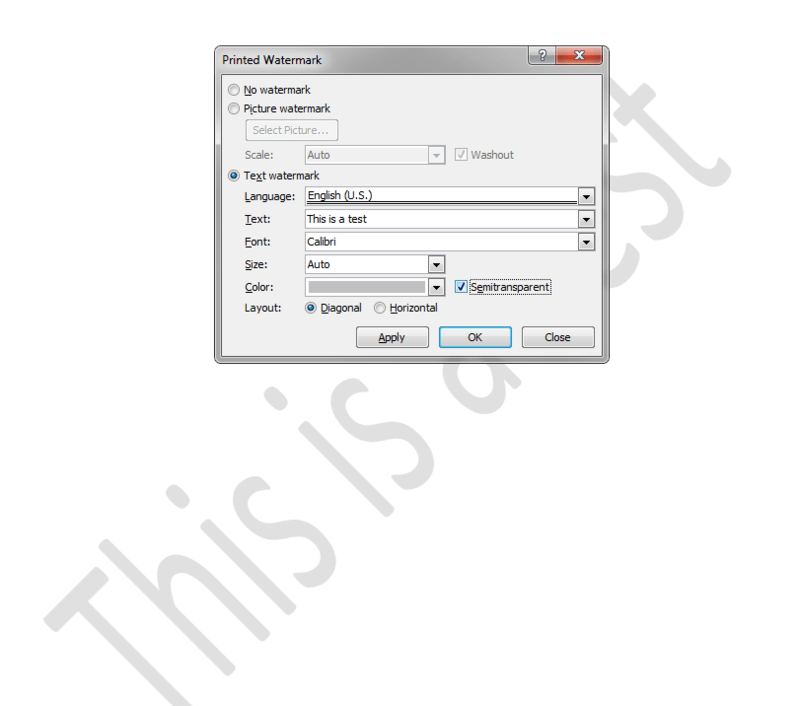 In the Edit WordArt Text dialog, type your watermark text. You may also select a different font and size. Click OK. 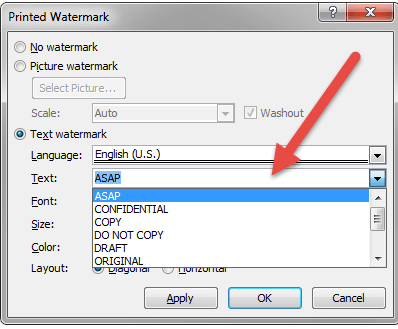 Your watermark should appear on the screen along with the WordArt toolbar. The watermark does not have to be in the Header placeholder. Note: Because the watermark is an object, you can click and reposition it anywhere on the page. You may also use the WordArt toolbar Free Rotate button to rotate the watermark or the Format WordArt button to adjust the colors and transparency. Once you have tweaked your watermark, close the WordArt and Header and Footer toolbars. Create you document. You’ll notice the watermark appears underneath your text. If you need to edit the watermark, go back to step 1 and click the watermark. 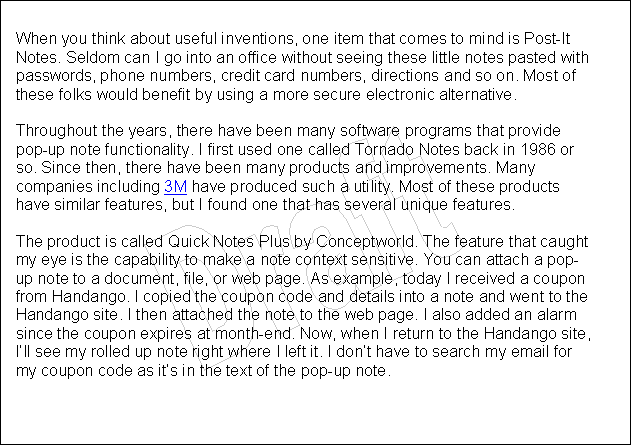 You may also need to go to View | Toolbars and select the WordArt toolbar. You can see a sample of a semi-transparent Draft watermark I use which is rotated and use 40% gray. Watermarks can be a valuable asset to any Microsoft Word document. They help convey the status of a document such as the “Draft” watermark or the importance of the data in the case of a “Confidential” watermark. With a little tweaking you can use this Word tool to create text or image watermarks.